A MUSICAL INSTRUMENT is a device created or adapted to make musical sounds. In principle, any object that produces sound can be a musical instrument - it is through purpose that the object becomes a musical instrument. The history of musical instruments dates to the beginnings of human culture. Early musical instruments may have been used for ritual, such as a trumpet to signal success on the hunt, or a drum in a religious ceremony. Cultures eventually developed composition and performance of melodies for entertainment. Musical instruments evolved in step with changing applications. best digital piano for students - engadget. Clavichord - European stringed keyboard instrument that was used largely in the late Medieval, through the Renaissance, Baroque & Classical eras. Cole Porter's piano gets a new home in New York - "Delightful, De-Lovely and Deconstructed: Cole Porter’s Piano Is Being Rebuilt." FranÇois Tourte - (1747-1835). French bow maker who made a number of significant contributions to the development of the bow of stringed instruments, and is considered to be the most important figure in the development of the modern bow. Harpsichard - musical instrument played by means of a keyboard which activates a row of levers that in turn trigger a mechanism that plucks one or more strings with a small plectrum. In Handel’s ‘Messiah,’ the Trumpet as Divine Agent - The New York Times. International Triennial Competition of Stringed Instruments - considered the Olympics of violin making. List of musical instruments - Wikipedia. LIST OF PIANO MAKERS - Wikipedia. Meet the world's most high-tech piano - The Telegraph. PLAYER PIANO - self-playing piano, containing a pneumatic or electro-mechanical mechanism that operates the piano action via pre-programmed music recorded on perforated paper, or in rare instances, metallic rolls, with more modern implementations using MIDI encoded music stored on floppy disks or CDs. rise of the synthesizer - "How an Electronics Whiz Kid Gave the 1980s Its Signature Sound." Recording studio as musical instrument - Wikipedia. STEINWAY METRONOME - compatible with iPhone, iPod touch, and iPad. 'The Organ Lives! ': Notre Dame’s Monstrous Organ Survives Fire - Listen to it Here! - ChurchPOP. Amati - "The Marketplace for Stringed Instruments." Antonio Stradivari - (1644 – 18 December 1737) was an Italian luthier and a crafter of string instruments such as violins, cellos, guitars, violas, and harps. Stradivari is generally considered the most significant and greatest artisan in this field. ARP 2600 synthesizer - Wikipedia. Artiphon Instrument 1 - "Strum a guitar, bow a violin, tap a piano, loop a beat – on a single instrument. An intuitive way to create music and play any sound." BALDWIN PIANO - established 1857. Subsidiary of the Gibson Guitar Corporation. BLÜTHNER PIANOS - founded 1853. "The Golden Tone." 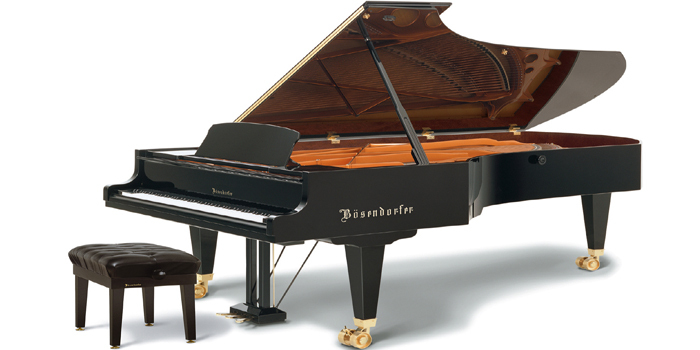 BÖSENDORFER PIANOS - established 1828. "Der Klang, der berührt." Boston Piano - designed by Steinway & Sons. BUFFET CRAMPON - woodwind instruments. C. BECHSTEIN PIANOS - since 1853. Carlo Ferdinando Landolfi - (c. 1714 – 1787) was a legendary, individual master luthier who was active in the Italian 18th century during the golden age of stringed instrument making. C.F. MARTIN & CO. - founded in 1833. Acoustic guitars. Chappell & Co. - (1810-1987). English company that published music and manufactured pianos. CONN-SELMER - manufacturer and distributor of concert band, marching band, and orchestral instruments. CONRAD GRAF PIANOS - Wikipedia. Érard - Piano & Harp Maker. FAZIOLI - grand & concert pianos. FENDER STRATOCASTER GUITAR - designed in 1954, and has been manufactured continuously to the present. FENDER'S NEW ACOUSTIC GUITAR HAS A MILLION DIFFERENT VOICES - Wired. GIBSON GUITAR CORPORATION - since 1902. Manufacturer of acoustic and electric guitars. Giuseppe Guarneri - (21 August 1698 – 17 October 1744) was an Italian luthier from the Guarneri house of Cremona. He rivals Antonio Stradivari (1644–1737) with regard to the respect and reverence accorded his instruments, and he has been called the finest violin maker of the Amati line. Giuseppe Rocca - (1807-1865). Italian violin maker of the 19th century. Rocca's preferred models were the 1742 Alard Guarneri and the 1716 Messiah Strad. HAMMOND ORGAN - invented by Laurens Hammond in 1934. HOHNER - harmonicas, accordions, melodicas, drums, guitars. Johann Andreas Streicher - (1761-1833). German pianist, composer and piano maker. 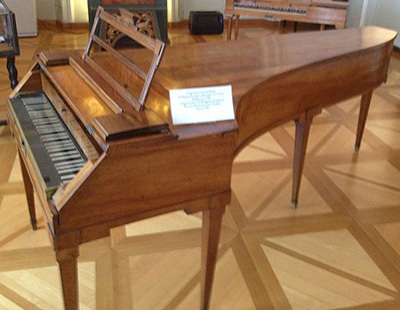 The Streicher piano-making business provided at least one fortepiano to Beethoven in his early years, of which the composer was fond, writing that it was "too good for me ... because it robs me of the freedom to produce my own tone". JOHN TAYLOR & CO. - dating back to Johannes de Stafford in the 14th century. The world's largest working bell foundry. KAWAI - founded in 1927. "The Future of the Piano." KNABE PIANOS - established 1837. LUDWIG - drum and percussion instrument manufacturer. MASON & HAMLIN - founded 1854. "World's Finest Pianos." Petrof - "Pianos Since 1864." Pietro Guarneri - (14 April 1695 – 7 April 1762) was an Italian luthier. Sometimes referred to as Pietro da Venezia, he was the son of Giuseppe Giovanni Battista Guarneri, filius Andreae, and the last of the Guarneri house of violin-makers. PLEYEL PIANOS - founded in 1807. REUGE - "The Art of Mechanical Music." Music boxes and performing birds. RICKENBACKER - became the world's first to produce electric guitars in 1932. ROLAND - Japanese manufacturer of electronic musical instruments, electronic equipment and software. SAUTER - upright pianos, grand pianos, piano benches. Schimmel - German piano maker since 1885. SELMER - saxophones, clarinets, bassoons and oboes. Stein piano dynasty - outstanding German maker of keyboard instruments, a central figure in the history of the piano. He was primarily responsible for the design of the so-called "Viennese" fortepiano, for which the piano music of Haydn, Mozart, and the early Beethoven was written. STEINWAY & SONS PIANOS - founded in 1853. STEINWAY & SONS Imagine Series Limited Edition piano - modeled after the white Steinway grand piano that John presented to Yoko Ono on her birthday in 1971. Each piano incorporates John's signature, music, and a medallion indicating its uniqueness. TAYLOR GUITARS - Taylor acoustic, Taylor T5 electric guitar. Walter's pianos - by Anton Walter (1752-1826. Described as "the most famous Viennese piano maker of his time". Wolfgang Amadeus Mozart bought a Walter piano in about 1782, and employed it in one of the most important phases of his career, the composition and highly successful premieres of his mature piano concertos. Whitechapel Bell Foundry - since 1570. bell foundry in Whitechapel in London, and is the oldest manufacturing company in Great Britain. The foundry's main business is the bellfounding and manufacture of church bells and their fittings and accessories, although it also provides single tolling bells, carillon bells and handbells. The foundry is notable for being the original manufacturer of the Liberty Bell, a famous symbol of United States independence. Wurlitzer Jukeboxes - founded in 1856. YAMAHA PIANOS - since 1900.